Reach-in closets are typically found in older homes or guest rooms. They are characterized by their single-hanging bar style, cut into a small wall opening, with or without doors. They often have hidden potential for stellar storage if designed properly. 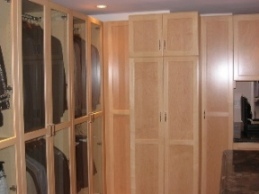 At The Custom Closet Company we excel at turning overwhelmed closet space into useable closet space. Does your reach-in closet have unused and wasted space resulting in a disorganized mess? Is your reach-in closet bursting at the seams with unorganized clothing and accessories? Do you wish your reach-in closet had space for hanging your bags, belts, scarves and accessories? Call the Custom Closet Company and we will solve all of your reach-in closet organizational needs. Here at the Custom Closet Company, we utilize home design and custom installation solutions to transform your bedroom closet. We understand the need for a well-organized closet. Our team at The Custom Closet Company will offer a free estimate to solve your closet needs. We will then craft and install well-designed solutions for you. We are ready to start organizing your spare closets today, don't delay, call for an appointment now. Call today (253) 245-3883 for an appointment with The Custom Closet Company. Your perfect custom solution is just a phone call away!